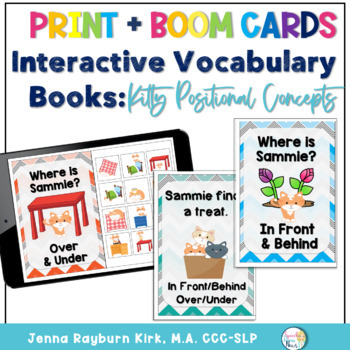 These Interactive Preschool Vocabulary books are designed for teaching vocabulary concepts related to positional concepts of over, under, in front of, and behind. The interactive books are designed to allow students to match pictures to each page of the book using velcro. -Sammie is over and under. -Sammie is in front and behind. Books 1&a3 are traditional IVBs. Read the story and match the picture. Books 2, 4, & 5 are positional books. On each page put velcro in both available boxes. Your student will move a kitty to the correct box based on the direction you read of the bottom of the page. This will test their knowledge of the concept. Book 5 is meant to be an overall comprehension check in story format rather than structured practice. 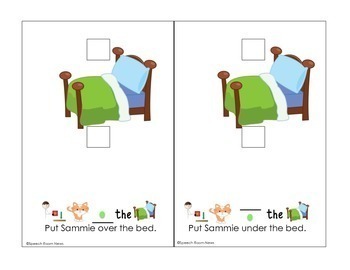 This set includes two worksheets to send home. It lists the vocabulary and leaves room for the SLP or teacher to write in what specifically the student worked on. The download is 48 pages in length. Please ask any questions before you purchase. 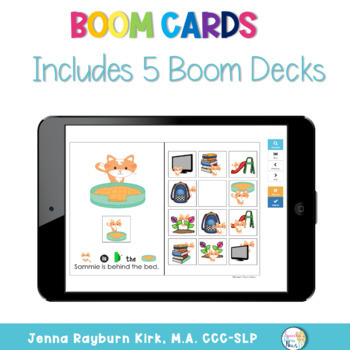 If you enjoy this download, make sure to check out my other interactive vocabulary books for The Wheels on the Bus, All About Me, Fall,Thanksgiving, Pumpkins, Around the House, Itsy Bitsy Spider, 5 Little Monkeys, Weather, Fire Safety and Back to School and more! Jenna Rayburn, MA, CCC-SLP is an ASHA certified Speech-Language Pathologist. She works full time as a school SLP in Ohio. Jenna was an invited speaker at the American Speech and Hearing Association Convention in 2016. She’s presented at the national, state, and local level about a variety of topics related to school-based speech and language therapy. 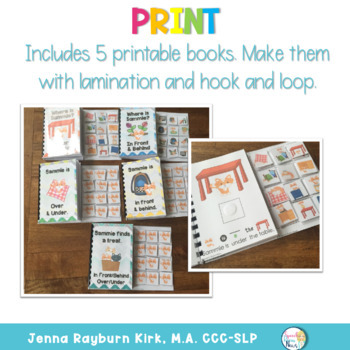 Jenna has created over 350 resources for her fellow SLPs and is the number one SLP seller on TpT.